Perak is an interesting state to visit. Its mountain ranges that sweep across the state, beautiful islands and the many interesting cultural and heritage sites beckon you to come and visit it. One interesting destination that you may want to consider putting down on your itinerary list would be the Sungai Klah Hot Springs. The ambiance here is one of serenity and tranquility that will definitely be able to relax your senses and help you unwind. 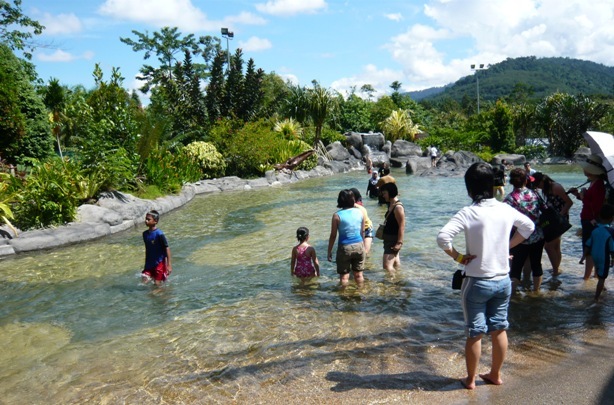 Situated in the district of Sungkai in Perak, the Hot Spring park is just a short drive away from Ipoh, the capital of Perak. If you are coming from the capital city, you will take about two hours or so to reach this destination. The recreational park has attracted tourists from around the globe to come here and use the many facilities that have been developed over the years for visitors to enjoy. The Therapeutic Pool is one of them and visitors can enjoy the healing benefits that come with the hot springs that land up in this pool. Enjoy yourself by dipping your feet or entire body into one of the hot springs here. They have therapeutic value and will definitely enhance blood circulation throughout the body. The hot springs are also known for its healing effects for a various number of ailments. You can also head down to the family bath area where it is large enough to accommodate an entire family. It is a perfect way to enjoy a weekend with your family. Also, traditional massages are available here if you wish to be pampered. You will love how you can Pamper yourself with a good traditional massage right here at the recreational park and the massage is definitely a good one that will help to completely relax your senses. The recreational park has a board walk and a few hot spring swimming pools where you can swim in. it will definitely be an experience you will remember for a long time because it is not every day that you get to swim in a hot springs swimming pool that has many health benefits that have been known to cure various ailments. Once you are done soaking up all the good points of the hot springs pools, why not head over to the food court in the recreational park itself that has many local delicacies dished up that wild definitely satisfy your appetite. The recreational park has also set up a souvenir shop where you can take home with you a memory of your day spent at the Sungai Klah Hot Spring Park.